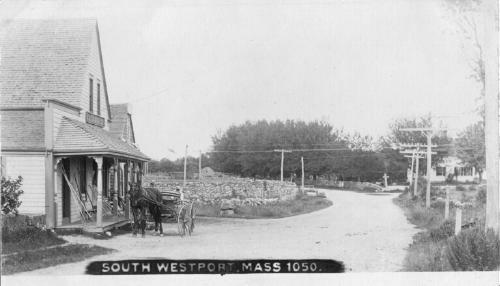 Village at South Westport was centered at the intersection of Horseneck, Hixbridge, and Pine Hill Roads by a general store and post office. Old Pine Hill Garage, built by Carlton D. Macomber, son of Bert Macomber and father of Carlton “Cukie” Macomber, is now located in the area of stone walls east of the store which is the center of the picture. The white house to the right in the picture is the Ezra Sanford House.